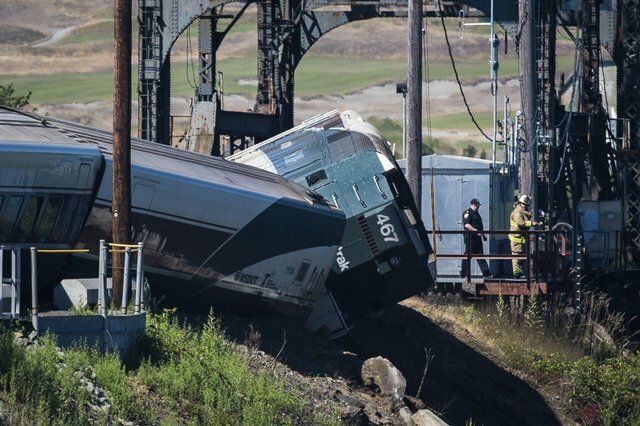 A major Amtrak train derailment in Tacoma resulted in dozens of injuries to several passengers near Steilacoom on Sunday afternoon, according to local news reports. The incident involved commuter train 506 on the Amtrak Cascades route which runs between Eugene, Ore. And Vancouver, British Columbia. An official statement from an Amtrak spokesperson indicated that several of the train’s cars derailed at the Chambers Bay bridge in Steilacoom. Investigators believe that the train derailed while it was crossing a narrow stretch of land which bordered the water at Chambers Bay bridge. The Gig Harbor Police Department dispatched patrol watercraft to assist passengers who had been ejected or were otherwise in danger of falling in the water. Photographs taken by passengers and bystanders show that the train fell on its side and was nearly submerged in the water. Amtrak is reporting that several passengers suffered minor injuries, but that no one appeared to have been badly hurt and all crew members were unharmed. All passengers were eventually evacuated and were transported out of the area. Burlington Northern Santa Fe Railway (BNSF) owns the tracks, while the states of Washington and Oregon are responsible for maintaining the railroad route. There was no additional information regarding what might have caused the incident or who would be held responsible. When a commercial vehicle accident occurs – whether it be a train, bus, or light-rail system – one of the first priorities of companies and any possible government agencies who may be held responsible for the incident is to interview all victims and witnesses as part of their investigation. Unfortunately, what often happens is that these companies and agencies send a team of investigators and lawyers to meet with the victims, sometimes when they are still in the hospital or recovering from their injuries at home. Although there is an aspect of due-diligence to the investigative process, these people are also likely looking for a way to absolve themselves of any liability or legal responsibility for the victims’ injuries. It’s an unfortunate reality that transportation companies hire defense attorneys and investigators to help them limit their own financial responsibility in the event of a tragic accident. If you or a loved one has been injured in an accident, the responsible parties may try to make offers of compensation or other benefits to the victims and their loved ones. It is always a good idea to consult with an experienced personal injury attorney before agreeing to any form of compensation or benefits after a serious incident, as you may be barred from pursuing a legal claim if you accept these benefits. To learn more about your legal rights and options after a serious train accident, contact the award-winning legal team at Davis Law Group. We’ll review your personal injury case absolutely free of charge and explain your legal rights and how we may be able to help.